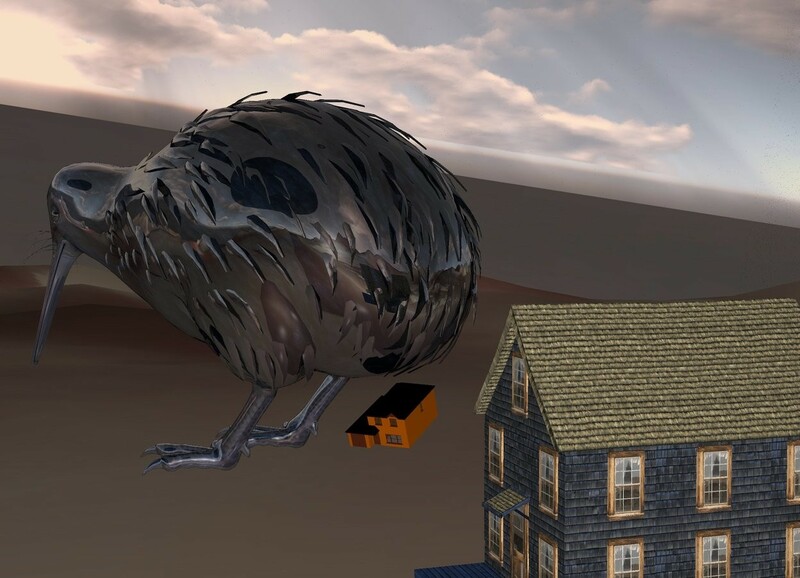 Input text: a 100 inch tall shiny 60% dim delft blue kiwi bird.ground is 100 inch wide [sky].the kiwi bird is 100 inch above the ground.ground is 80 feet tall.it is evening.ambient light is gray.sky is 7000 feet tall.sky leans 10 degrees to north.a 50 inch tall 50% dim delft blue house is -30 inch right of the kiwi bird.the house is 10 inch behind the kiwi bird.the house is facing southeast. the second house is -2.5 feet behind the kiwi bird. it is 1 foot tall. it is 8 inches above the bottom of the kiwi bird. it is facing right. it is leaning 20 degrees to the front.